If the idea of a successful and decentralized digital currency seemed ridiculous a few years ago, now we’re laughing of all those non-believers who mocked Bitcoin power. During the last year, Bitcoin has surged more than 300% to almost 60.000 transactions per day. To better understand what’s going on in the world of virtual coin, The Wall Street Journal talked with Gavin Andresen, a 46 year old lead software developer for the Bitcoin project. He his still hoping to learn whether “a nongovernmental global currency” is possible. “Can you get from where we are to the vision of billions of people all over the world using Bitcoin just like they use any other currency? That’s the grand experiment”, he says. With the development of this new era, thousands of online merchants, especially the smaller ones, are already accepting Bitcoins. And the users are thankful for that. 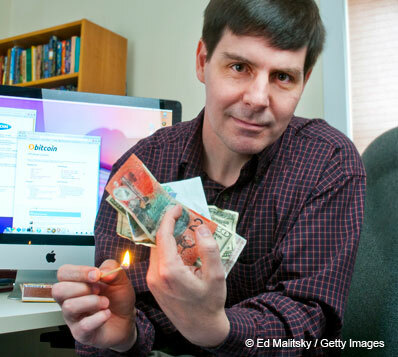 This is one of the signs that makes Gavin Andresen, chief scientist at the Bitcoin Foundation, think that Bitcoin has already begun to replace the US dollar. That’s a reality, at least for him, since he’s now getting his wage in Bitcoins. Until now, he managed to persuade his barber to accept virtual currency, paying half a Bitcoin for a hair cut. And even doe the IRS won’t accept Bitcoins, his salary isn’t tax-free. “I get paid in Bitcoin every month. Taxes are computed based on the dollar equivalent”, he tells. Gavin Andresen’s job consists in refining the software that allows Bitcoins to be traded and stored, a task he finds “fun and terrifying”. The terrifying part is because of the sudden software changes that can happen and also the technical glitches, hacker attacks, speculation and fraud, that have recently caused wild swings in the dollar price of Bitcoins. However, the most intriguing side of Bitcoin is the premise that the number of existing Bitcoins will be capped at 21 million. How can that be? Because the software is hard-coded to create that amount over the course of decades, on a prearranged and transparent schedule. At the moment, there are more than 11 million Bitcoins in circulation.